The Colour Carousel: UK Beauty Blog: What I Received For My 21st Birthday! What I Received For My 21st Birthday! Hello! I turned 21 on Wednesday and thought I would write a 'what I got for my birthday post' for those of you as nosy as me out there! I know there are often mixed opinions about this type of post, so I will start by saying I am not bragging about what I received as gifts at all- I feel very lucky and grateful and simply enjoy sharing things I love on my blog. I know I love to read other people's birthday posts and so I thought I would share my own with you :) I won't write about every little thing, as for one I received a huge amount of chocolate and sweets haha! The main present I got off my parents was this gorgeous Radley handbag! I have never owned a designer handbag and have lusted over Radley for ages. I had no idea I was getting this and can safely say it was love at first sight. I believe this bag is called a Radley 'Whitmore Punch Hobo-Bag', but I have struggled to find much information online about it. 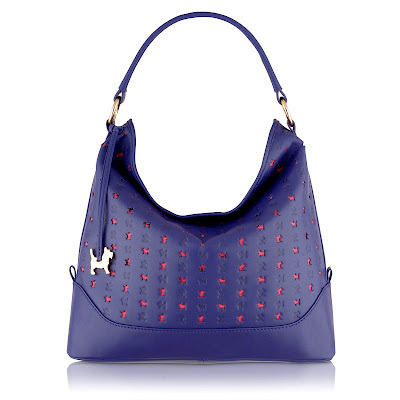 I love the cute cut out Radley dogs all over the front! I also received the necklace in the image below off them (among chocolates and other things!) which is from accessorize- possibly the cutest necklace in the universe!? My sister put together a lovely little hamper of things, every little thing I loved and it shows she knows me too well. There was more in the box but I have photographed a few of the things she put in it separately so that you can see everything properly. In the photo above is a lilac/purple Rimmel Glam Eyes Eyeshadow, some Percy Pig sweets (my all time faves), a Cath Kidston badge with the cutest dog on it ever and some Paperchase bumble bee drawing pins! Below are the final two things I received from my sister, a pair of perfect high-waisted mint/brown spotty shorts and a double necklace with different coloured chains and cute charms. Below are a mixture of things from a few different people. My lovely boyfriend bought me the novelty socks (it seems to be a tradition of ours haha), a Lush bath gift set, a chicken print apron (don't ask!) and other things not pictured like fudge and biscuits! My main present from him is something I will talk about further down this post. My Step-Dad bought me the Barry M 'Coral' nail polish, the French Manicure set and the two nail foil sets. It is so lovely of him as he picked them all out himself, I was so impressed! The Sunflowers perfume is one of my favourite perfumes, bought by one of my fantastic pals. The colours he chose were L-R: 'Trax', 'Sumptuous Olive', 'Humid' and 'Woodwinked'. To say I was excited is a massive understatement! It is safe to say I will be posting about these in more detail at some point soon. The final thing I will show you is the main present from my lovely boyfriend of 6 years, Daniel. He bought me a Chamilia charm bracelet and the purpley-blue iridescent glass bead in the image below! It is so beautiful and I feel incredibly lucky. The cat charm in the center is one I bought myself and the orange/white glass bead on the right was bought by Daniel's sister, which was so nice of her! I received so many lovely things besides what I have shown you also, I feel so lucky! I hope you enjoyed reading this post as much as I enjoy reading other bloggers' birthday posts. Thanks for reading! happy birthday! you got spoiled for sure, and I love those turquoise shorts! Aw this is all so adorable, lucky you! I'm so nosey, I love these posts haha. Hope you had a fab day, with all that food I know I would have! A Rather Unusual Nail of the Day...Ooops!